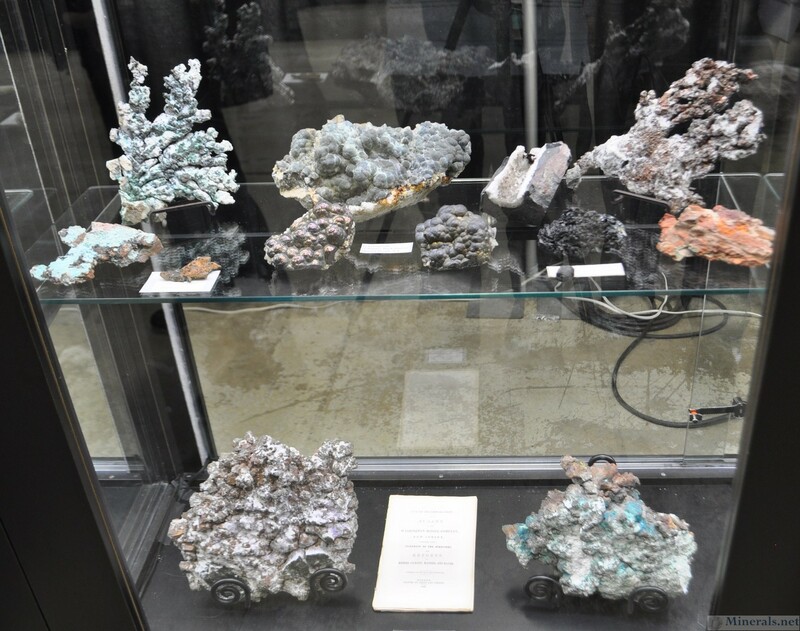 This past weekend was the Franklin Mineral Show in Franklin, New Jersey. Franklin is the "Fluorescent Mineral Capital of the World", and one of the world's most prolific localities in the amount of minerals it has produced. This show is a great compliment to this wonderful mineral locality. The Franklin Show is located in the grounds of the Franklin public school, and takes over the outdoor and indoor part of the school. There are two Franklin shows every year, one in the spring and another in the fall, with both being a similar format. The weather was excellent both Saturday and Sunday, and this really enahanced the outdoor part of the show, where dozens of dealers had setup and were enjoying the bright sun and perfect spring temperatues. 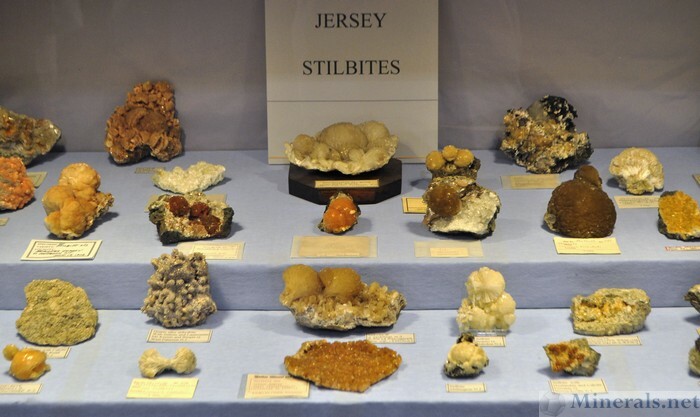 Many of the local dealers and mineral people in the area coming together to both buy and sell, and there is an especially strong presence of local New Jersey material at this show. 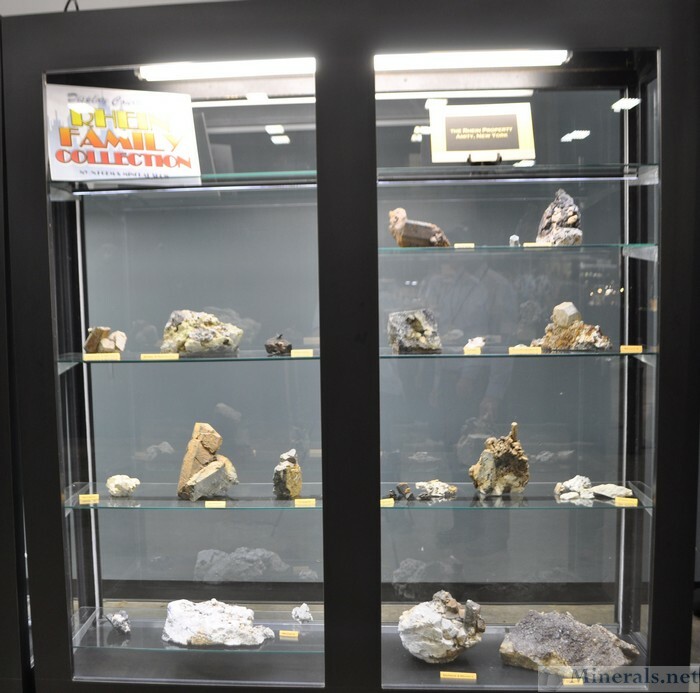 The indoor part of the show has a fluorescent display room with both public exhibits of fluorescent minerals as well as those for sale. 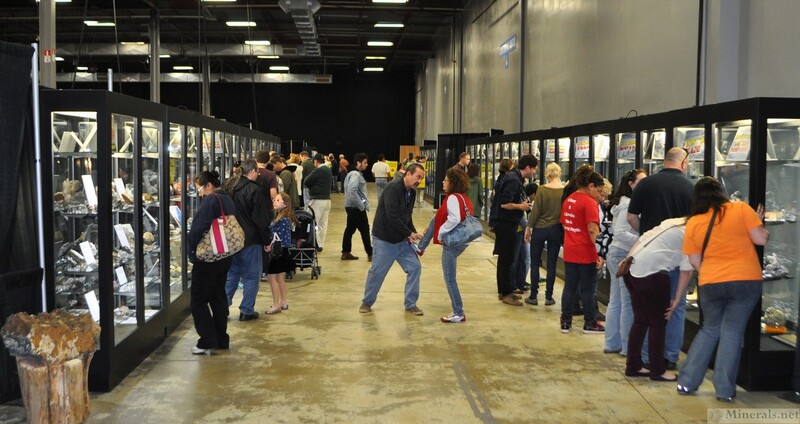 The show also arranges a small public exhibit, and I took photos of these. Unfortunately, I did not bring my camera tripod, so I was unable to properly capture the fluorescent display. 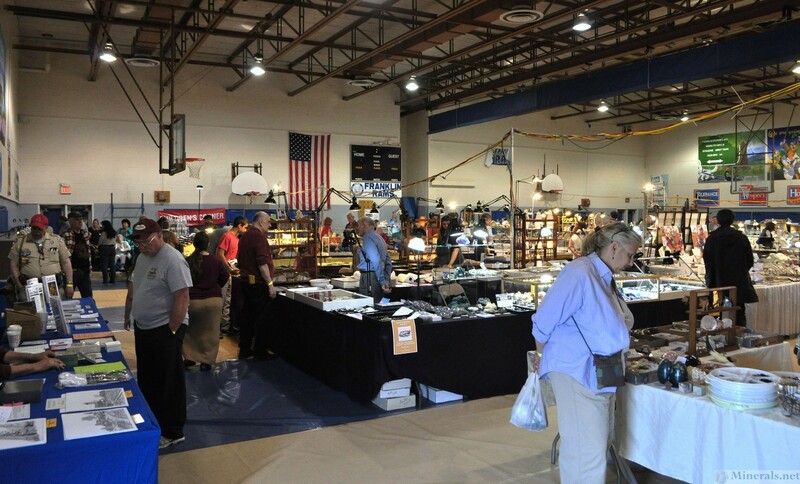 Here are some pictures from the show that I took on Sunday. All these photos can be clicked for an enlarged pop-up. Fluorescent Exhibit. I apologize for the poor image quality of the fluorescents. 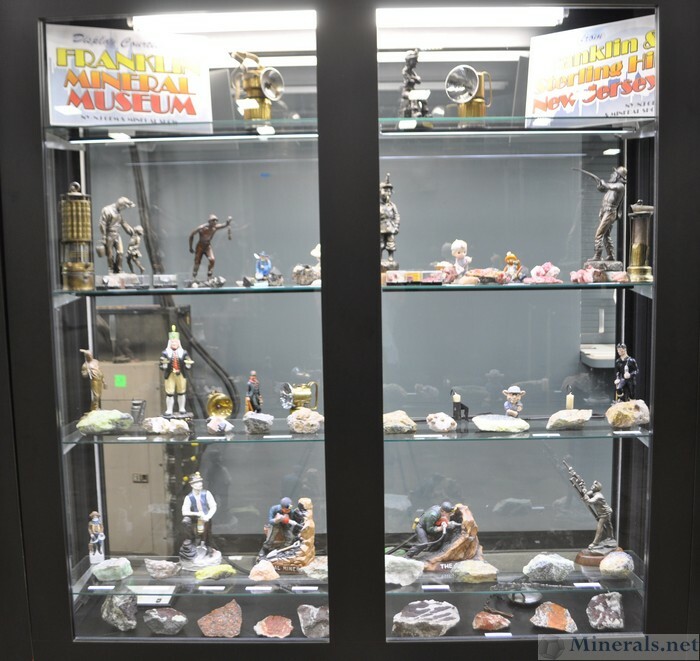 Display case of Steven Kuitems - "Classic Franklin Minerals"
We have blasted our latest edition of the Minerals.net online newsletter. 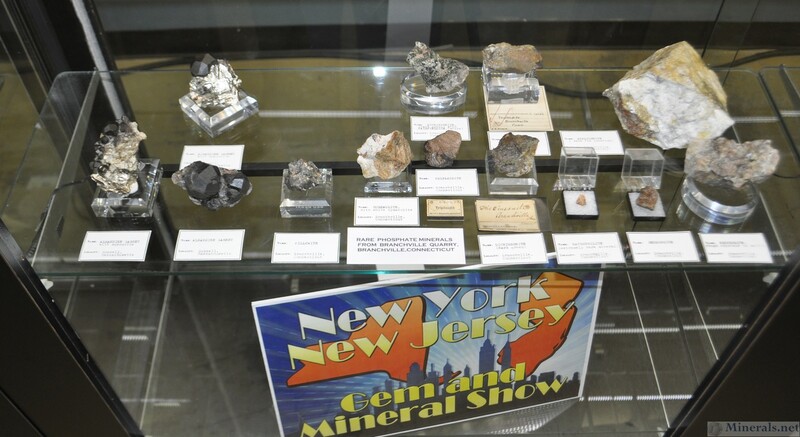 This is our final posting of the NY-NJ Gem & Mineral show. 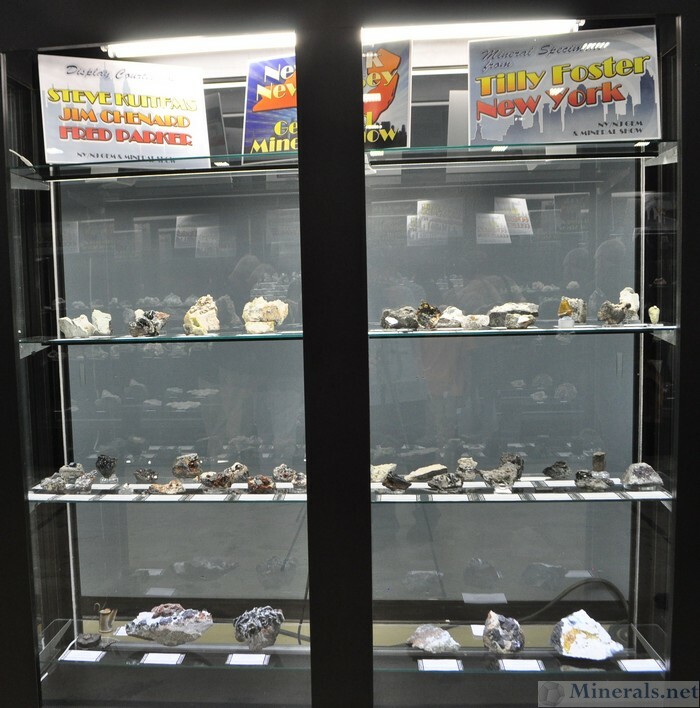 This posting showcases some of the fluorescent display cases that were hosted by the show. The cases were setup by the Franklin Mineral Museum in a darkroom, with a nice variety of different fluorescing minerals from Franklin and Sterling Hill. 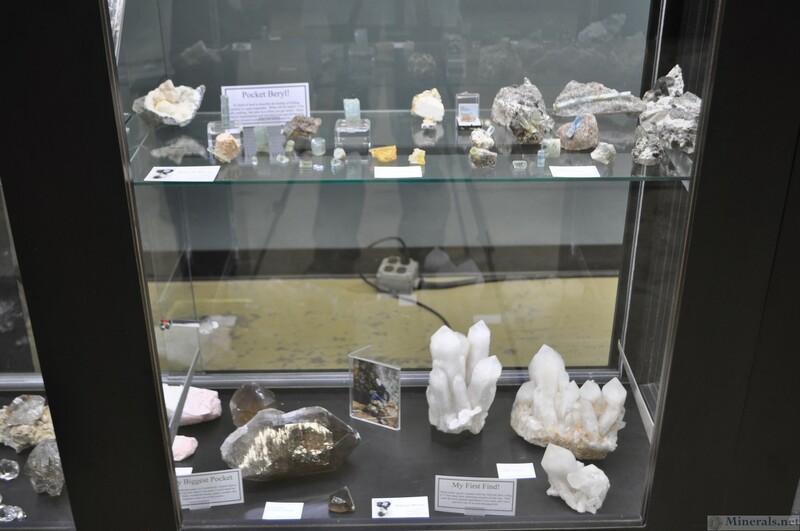 There were several cases with large Ultraviolet lamps above the cases shining on the minerals. There was even one case that was open without a glass in the front, so that the minerals in the case could be touched. 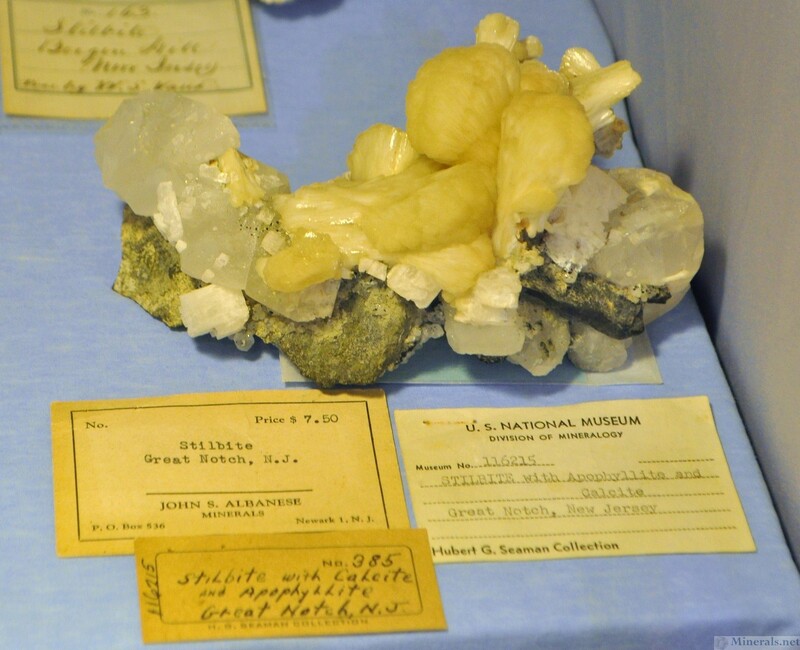 Glenn Rhein also had a case present of minerals from his finds in nearby Amity, New York. 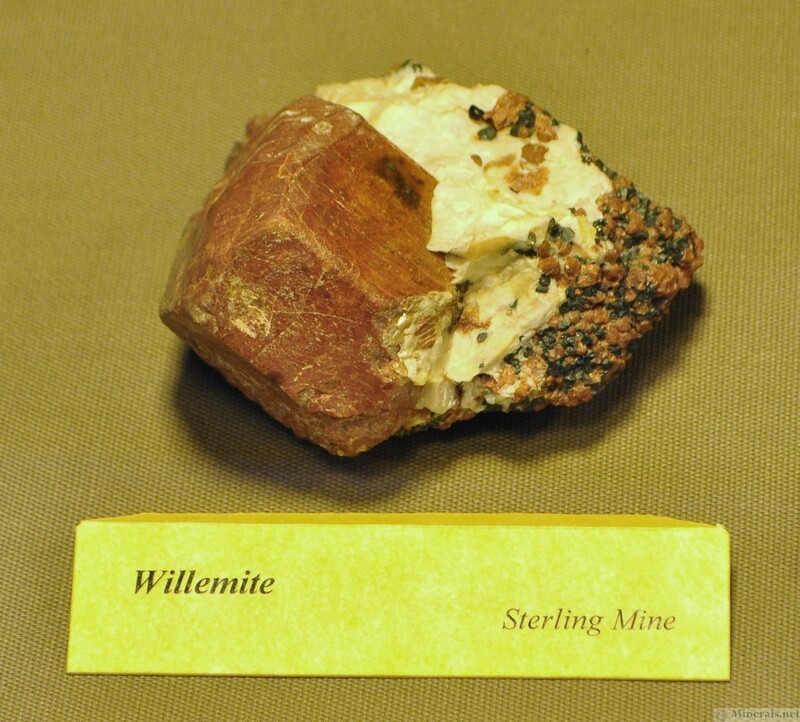 The two most promiment fluorescent minerals at Franklin are Willemite, which fluoresces green, and Calcite, which fluoresces orange. This report shows the display cases of Bradley Plotkin, Glenn Rhein, and the Franklin Museum. 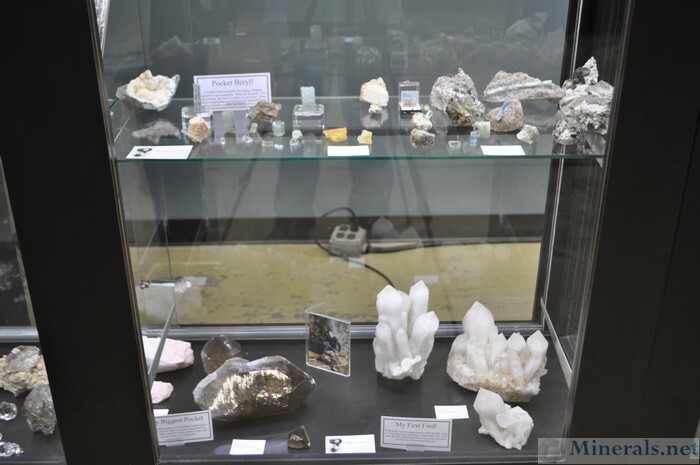 Bradley Plotkin is a collector specializing in New Jersey minerals, and his collection is one of the finest of the area. His collection also contains many historic specimens, including those from the Bergen Hill Railroad cut in the Palisades cliffs across Manhattan. 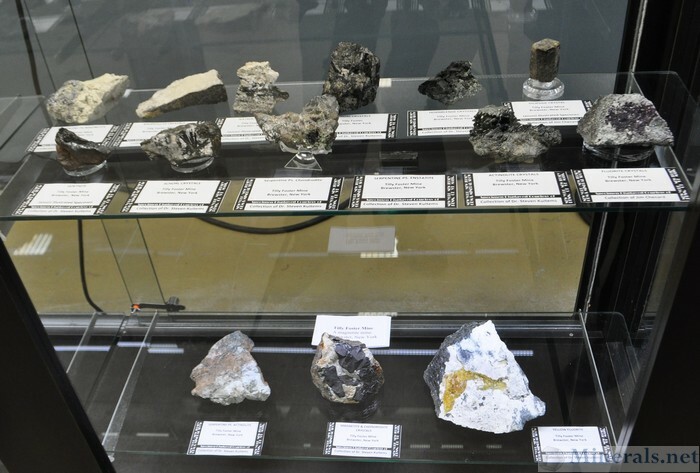 Brad filled two dislay cases, showcasing Bergen Hill minerals, copper minerals from New Jersey, as well as several other New Jersey localities such as Millington. Glenn Rhein put up a case of the finds on his property in Amity, New York. Glenn found an amazing discovery of many different minerals, with some exceptional scapolite, diopside, titanites, and spinels. (We have produced a video report on Glenn's amazing find.) 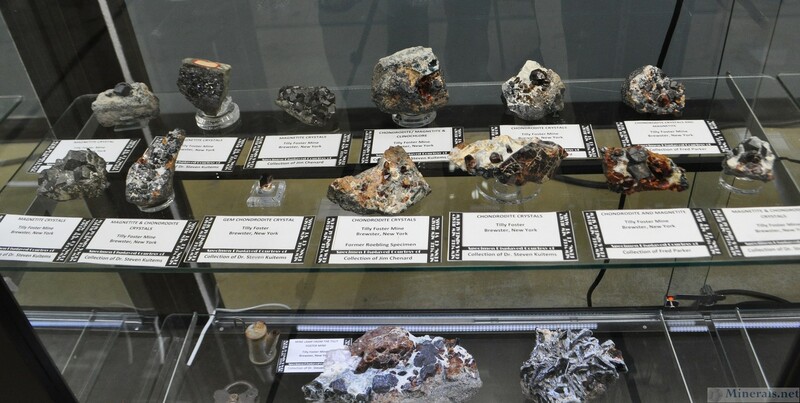 Glenn also brought two very large scapolite and diopside crystals sitting outside of the cases on a pedestal for people to touch. The Franklin Mineral Museum also had several cases, with some exceptional minerals from Franklin and Sterling Hill, as well as some museum artifacts. 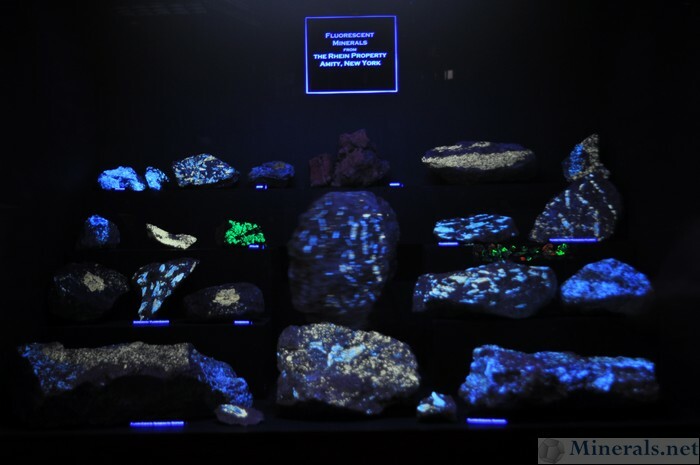 The location of Franklin, New Jersey, is one of the most well-known mineral localities worldwide, and aside from the huge assortment of minerals found there, Franklin is also considered to be the world's premier fluorescent mineral locality. Aside from the regular exhibit, the Franklin Museum had a special fluorescent room. This will be further discussed in the next post. Note: All these photos can be clicked for an enlarged pop-up. Brad's Exhibit on the Bergen Hill minerals, on the Palisades cliffs in New Jersey. 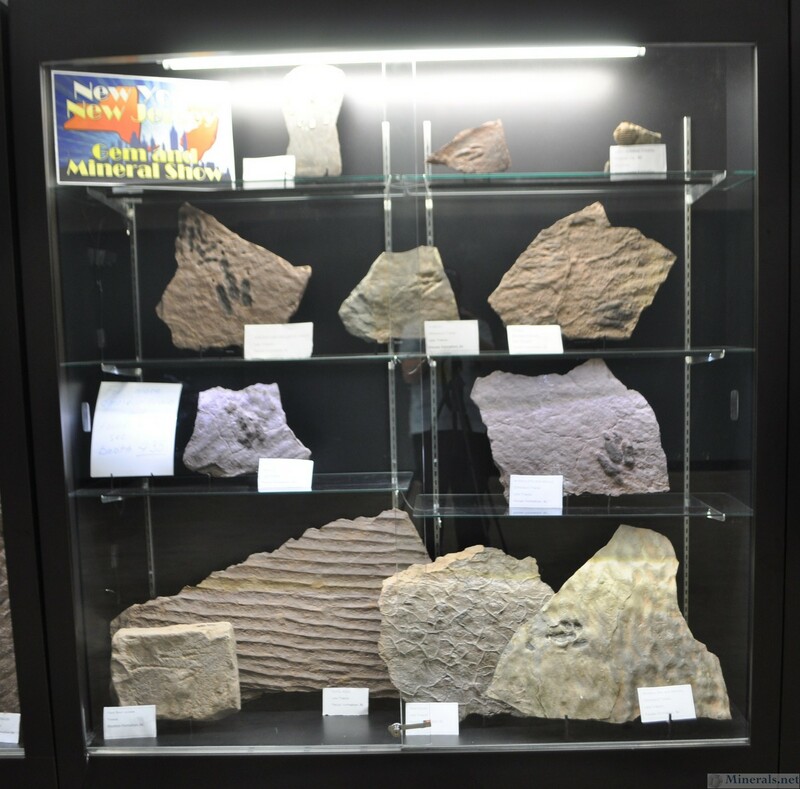 Specimens from this locality are classic material. Very large piece of Scapolite and Diopside brought by Glenn. This was out on a table for people to be able to touch. I apologize for this picture and the one above it for being a bit blurry. 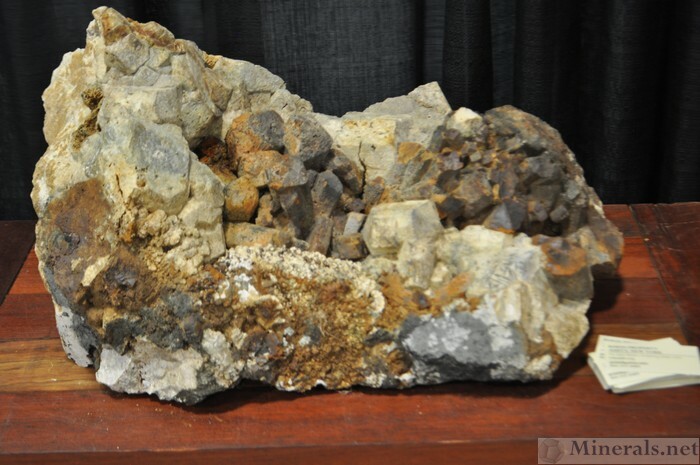 Zoom into some of the minerals in one of the Franklin cases. 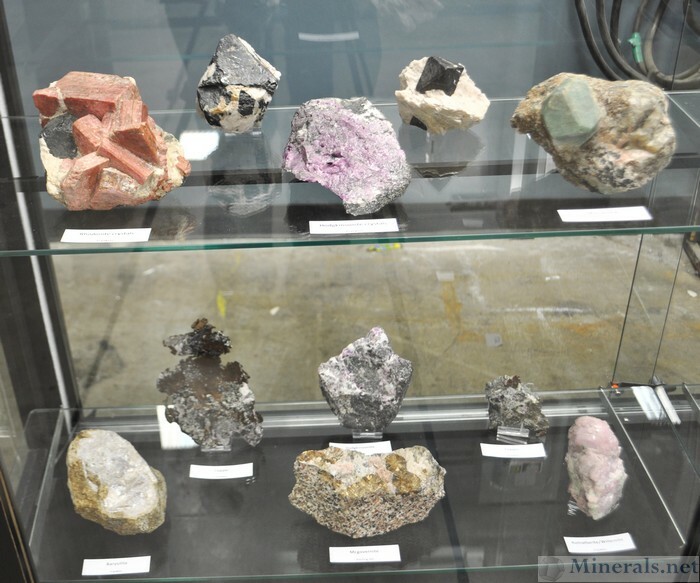 Note the exceptional Rhodonite cluster on the top right. 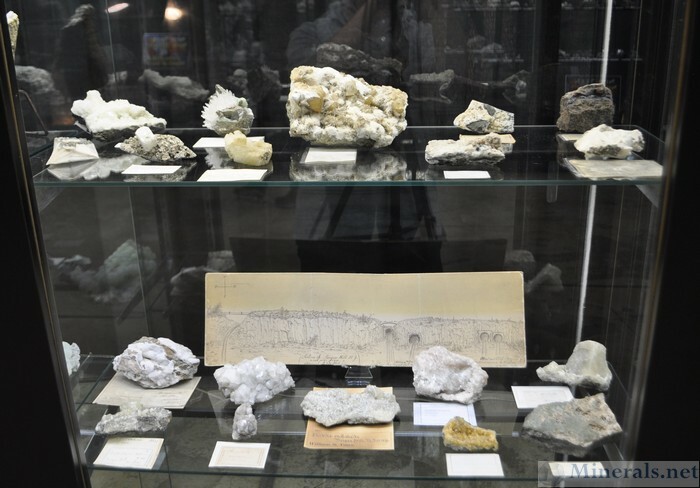 This next report features the display of Steve Kuitems, Jim Chenard, & Fred Parker, who have one of the top collections of minerals from the Tilly Foster Mine in Brewster, New York. The Tilly Foster Mine was an old iron mine that produced a very large amount of ore. Mining ceased entirely in 1897 after a terrible accident where 13 miners were killed in a rockslide. 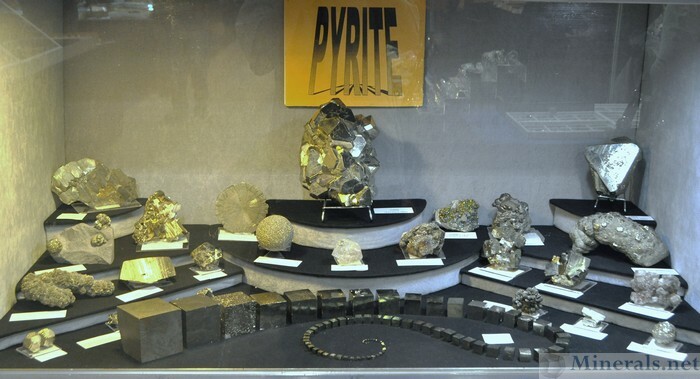 All specimens from this mine are considered classic; modern specimens do not exist. This mine produced some of the finest titanite and chondronite in the United States, along with a host of rare serpentine minerals and odd pseudomorphs. 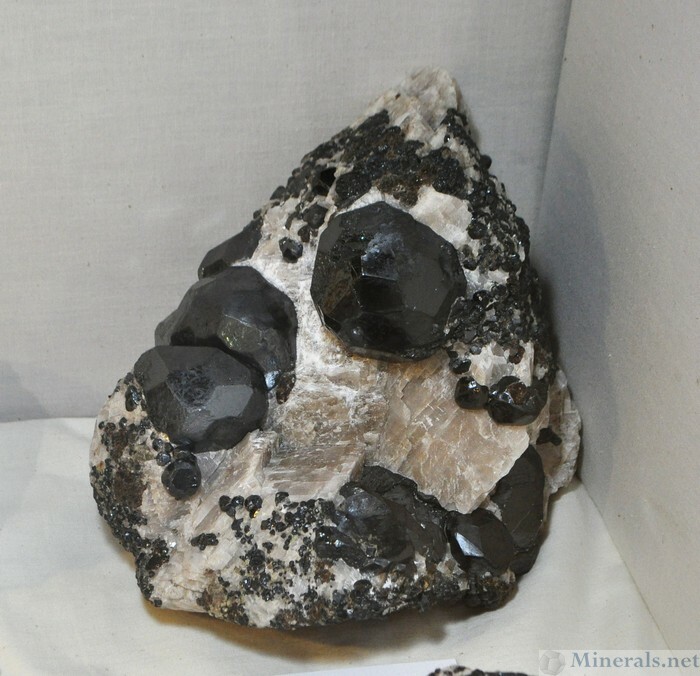 It also produced some exceptional dodecahedral magnetite over the course of its operation. Also featured in this post are some minerals from some other localites in the Northeast, specifically Connecticut and New Hampshire. 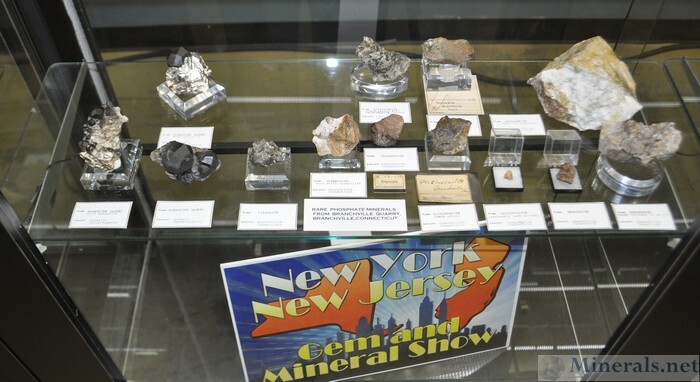 Although the show theme was originally only New York and New Jersey minerals, some local collectors wanted to expand the exhibit to include other Northeast localities, so there were a few cases of material from other Northeastern states.